PHILLIPSBURG – On Thursday, February 16, Port St. Maarten Management headed by Chief Executive Officer Mark Mingo, met with U.S. Consul General Margaret D. Hawthorne where a number of very important matters regarding security were discussed including the Enterprise Risk Assessment and Portbase Port Community System plans and work methods. It was agreed with the U.S. Consul General for Port St. Maarten and the Consulate to meet once a year to exchange information and continue to strengthen ties that would further improve local and U.S. business interests. Hawthorne was informed about the strategic agreements and relationship that the port has with U.S. cruise lines; current homeporting investments and future plans and how preclearance would further enhance expansion of the aforementioned; and growth in cargo shipping and trans-shipment as well as cruise ship provisioning – currently at 35 per cent. Hawthorne informed port officials about discussions currently taking place for U.S. Customs and Border Protection (CBP) preclearance for Sint Maarten. Preclearance operations is the strategic stationing of CBP law enforcement personnel overseas to inspect travelers prior to boarding U.S.-bound flights CBP has more than 600 law enforcement officers and agriculture specialists stationed at 15 air Preclearance locations in six countries. In Fiscal Year 2016, CBP personnel stationed abroad precleared 18 million travelers, representing over 15 per cent of call commercial air travelers to the United States. The U.S. Consul General was informed about the Port's proactive approach to implement a more disciplined risk management process in line with its corporate governance policies. Ernst & Young (EY) Advisory Services was contracted in the first quarter of 2016 to carry out the study which was submitted to management in September 2016. Destination Sint Maarten is one of the world's leading cruise destinations. The cargo operations of Port St. Maarten are rapidly becoming a port of choice for regional transshipment. Port St. Maarten comprises of 13 companies that are responsible for most of the country's island maritime activities which can be summarized in four pillars, namely, Cruise, Cargo, Yachting and Real Estate. Based on Port St. Maarten's responsibilities and critical role in maritime matters, EY Advisory Services was contracted to carry out an Enterprise Risk Assessment which took place between January to May 2016. EY is a global leader in assurance, tax, transaction and advisory services. Port St. Maarten Management understands the importance of the ERA based on global security and safety trends and developments which it keeps abreast of and follows keenly via attendance of conferences and workshops throughout the year and via meetings with cruise and cargo partners. Based on the identification and assessment of the Port's key business risks and taking into account the effectiveness of management and control activities, the Port's residual risk profile has been developed. The residual risk profile enables the Port to develop its risk response strategy, based on the organization's risk appetite, in order to effectively manage the risk profile. The U.S. Consul General also received an update about Portbase, a Port Community System, where companies can benefit from a multitude of intelligent services for simple and efficient information exchange, both between companies and between the public and private sector. Port St. Maarten's priority is security first, ensuring safe, secure use of Port Community Systems. Portbase was created by a merger between Rotterdam's Port infolink (est. 2002) and Amsterdam's PortNET (est. 2000). The new organisation was set up in 2009 by the Port of Rotterdam Authority and Port of Amsterdam and enjoys wide support amongst the port business community. Port St. Maarten Management representatives visited Portbase in the Netherlands mid-2016 to gather information about the system which will be implemented at the port as part of the ports enhanced security measures. Other areas discussed with the U.S. Consul General were an update on the successful completion of the screening process of the Port St. Maarten CEO position; third party screening process at the port; an update about the ISPS (International Ship and Port Facility Security Code) Port Security Audit being carried out by American Guard Services; and about Recognized Security Organization Mario Biabiany who is currently assessing Port St. Maarten's ISPS Security Plans. U.S. Consul General Margaret D. Hawthorne was appointed in April 2016 as Principal Officer of the U.S. Consulate General in Curacao and U.S. Chief of Mission to the Dutch Caribbean. Hawthorne, is a career member of the U.S. Foreign Service with 25-years of experience as a U.S. diplomat. Representing Port St. Maarten in the meeting besides the CEO, were port officials Bertrand Peters and Ichel Moeslikan. The U.S. Consul General delegation included Willem J. Remie, responsible for Public Diplomacy/Political Economic Affairs. 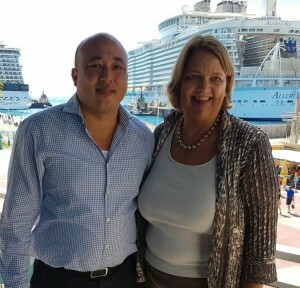 Caption: Port St. Maarten CEO Mark Mingo and U.S. Consul General Margaret D. Hawthorne.